This Slideshow takes you through the process of building “The Aquaponics System” from blowing the glass to installation. With Aquaponics water is preserved, waste utilized and healthy unadulterated plants, fish and shrimp cultivated. 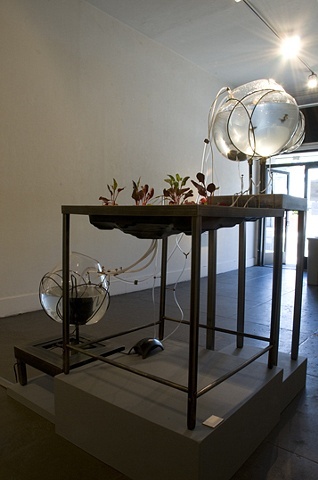 This aesthetically pleasing aquaponics system was the center of my senior thesis exhibition, it was meant to highlight possibilities and to show the beauty of dynamic relationships in a system. The system of aquaponics cultivates fish, plants and bacteria. With the correct balance you can produce fresh fish and vegetables with approximately 8% of the water used in traditional farming. It is my hope that aquaponics will be instrumental in creating the just and sustainable food future I wish to see.